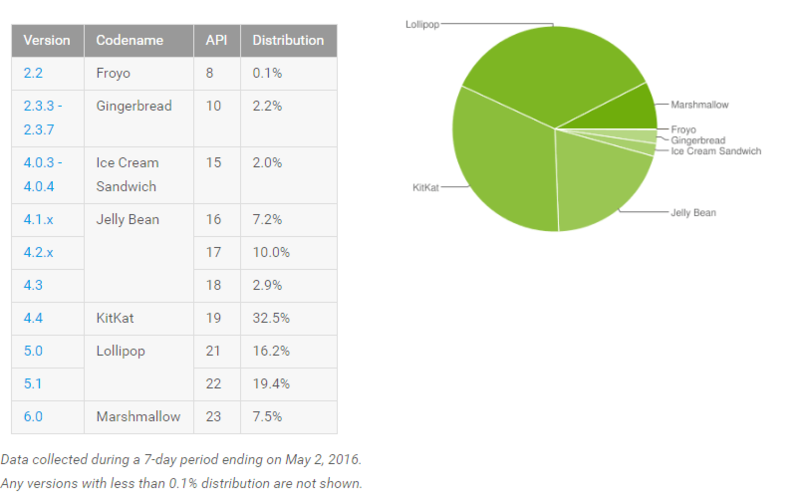 Android Marshmallow continues to grow in adoption as its install base has now reached 7.5% of devices coming to the Google Play Store over the course of the week ending May 2nd. That figure represents a 2.9% increase over the same report last month or a growth of 72% over the course of the month. With the number of devices that have received the Marshmallow update over the course of the last 4 weeks, the news is hardly a surprise but it is great to see nevertheless. Perhaps equally as important, Marshmallow is the only flavor of Android that is gaining in install base. down across the board which is good for developers as well as consumers. Overall Lollipop and Marshmallow now make up 43.1% of the install base of Android. That is up by 2.7% over last month. Overall it is good news for Marshmallow and really for everyone in the Android community. Still, at less than 10% of the install base and Android N looming around the corner, it will be interesting to see just how high it gets over the course of the next few months. You can read the full report here and check out all of the details.